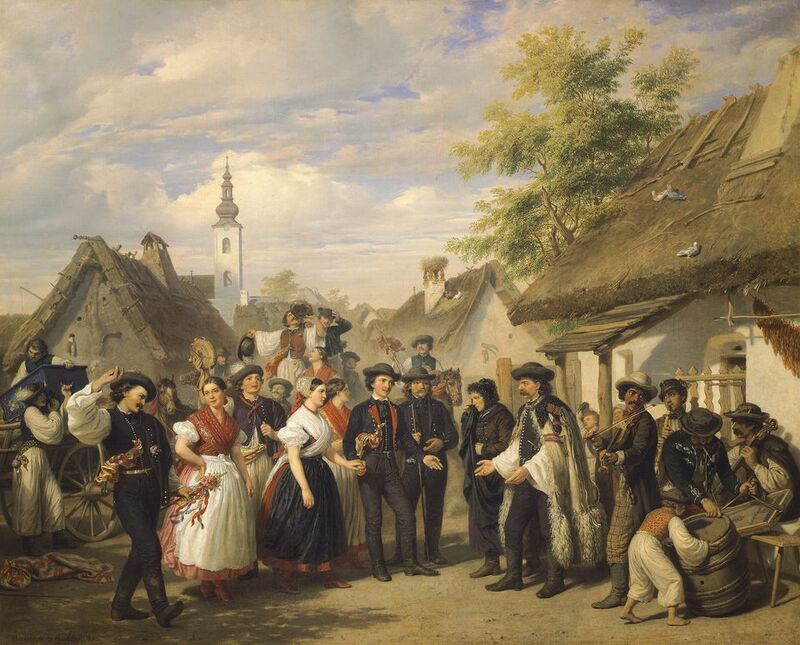 In the old days in Hungary, it was the best man's job to personally invite guests to the wedding, and to arrange for up to three days of festivities. Brides wore colorful and elaborately embroidered dresses and decorated headdresses which included woven wheat as a symbol of fertility. Often, the entire village got in on the action, forming a procession behind a colorfully decorated cart carrying the bride from her parent's home to the groom's home or church. Sometimes, along the way, she would be "kidnapped" by the guests and have to be rescued by the groom before the ceremony. Upon arrival at the groom’s home, his parents would greet the bride with a glass of wine, which she would drink and then toss over her shoulder, allowing it to break. Often, the couple would break plates on the floor. The more pieces, the more successful the marriage would be. After a required civil ceremony in the courthouse, a religious ceremony took place in the church at which guests read poems, sang songs, or related some funny story about the couple. Engaged Hungarian couples wore their rings on their left hands. Once they were married, they switched to the right hands. At the reception, there's an endless supply of food, flavored with paprika which was believed to have magical properties, dancing, singing, and violin playing. As with other Eastern Europeans, male guests paid to dance with the bride, either pinning the money to her dress or dropping it into her shoes, which are in the middle of the dance floor. It was traditional for the bride to present her new husband with a gift of either three or seven (lucky numbers) handkerchiefs, and for the groom to give his wife a small bag of coins.